I took advantage of cheap tickets and flew to Cancun, Mexico for $281round trip. The tour-book said that you can get by with speaking onlyEnglish, spending only US dollars and eating only familiar food in Cancun. You will be surrounded by familiar American restaurants,mega-hotels and shops there. Fortunately, it is not only Cancun in the Yucatan peninsula. Just 130 km South from Cancun the nice city of Tulum is located. It is small town with very distinct Mexican feel. I stayed in the very popular Weary Traveler hostel in a dorm for $8. I stayed in a hostel not because it is cheaper then hotel, but because it is better. It has large shady patio with tables where travelers eat, drink, socialize and sometimes do drugs. It has special appeal for gourmet cooks, as it has elaborate, industrial grade kitchen. People were cooking quite sophisticated dishes there. I fried zucchini (provided by hostel) for the breakfast, and fried potatoes with onions for dinner. I do not like Mexican food. They cut everything in small pieces and add enormous amounts of pepper until taste of original food is completely lost. From Tulum I took a mini bus to the end of the road along the ocean shore to village Punta Allen. 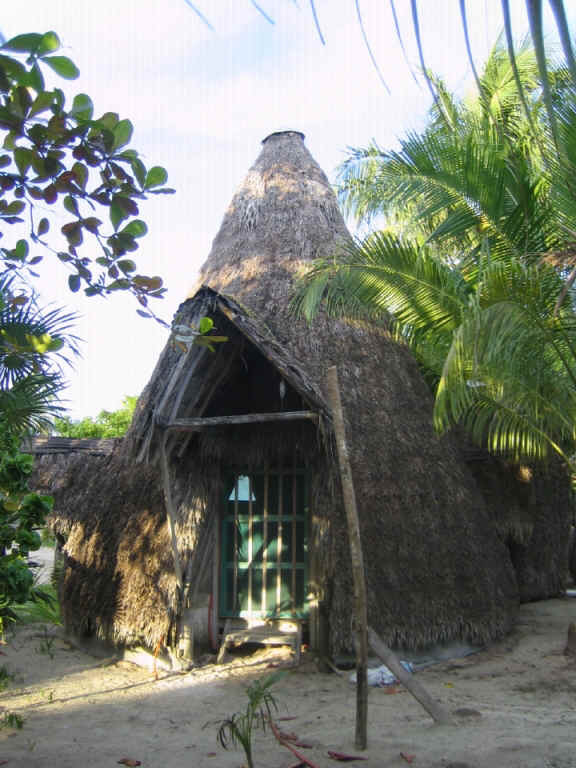 I stayed in palapa, the house made of palm leaves. Surprisingly it has a toilet, shower and electricity, but only in the evening. 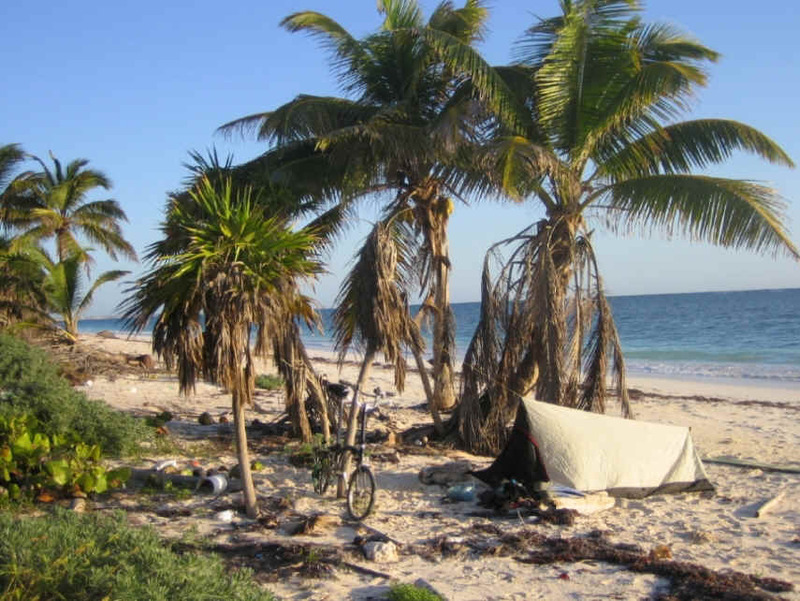 I went back to Tulum on my bicycle. It took two days. By the end of first day I found little, barely noticeable path from the road to the ocean shore, and spent night at the beach, alone. There was no any sign of civilization around. I drank coconut juice which I got by making two holes in coconuts using a screwdriver. I developed this technique 5 years ago. I caught three big lobsters and boiled them in turn in my large mug. Friendly restaurant owner in Tulum told me that they never got live lobsters in restaurants, only frozen ones. This is why they do not boil them, only grill. Frozen lobsters are not appropriate for boiling, she said. I also rode bike from Tulum to the little known Mayan ruins Muyil, 27 km South from Tulum. I was the only visitor on that site. It is quite different feeling compared with visits to such popular places as Chichen Itza, where you are surrounded by hordes of tourists and guides with megaphones. Here I walked alone, along unmarked trails and periodically encountered mystical Mayan ruins often overgrown by vegetation like at Angkor Wat, Cambodia. The nice campground behind Oskar y Laly restaurant about which I wrote to you 5 years ago does not exist anymore. A hurricane destroyed the restaurant and little cozy Suliman bay behind it. Even topography of the place is changed. Ocean debris are thrown very far to the shore. It indicates how huge were waves. I planned to spend a night there in my tent, but changed my mind. There was a feeling that the shadow of death and destruction is still present in this place. The restaurant, however still exists, but the owner moved it from the shore to main highway Cancun-Tulum. From Tulum I went to Merida and stayed again in a very cozy Nomads hostel. Some European backpackers came here year after year. Why? they like the city. Merida is a party town. Every evening, the center of the city is closed for traffic, tables are put on the streets, many orchestras start playing and all-city party starts. Food is pretty cheap. My favorite frijoles sopa which came with bunch of doritos and sauces cost only 30 Pesos. 1 dollar=13.5 Pesos. 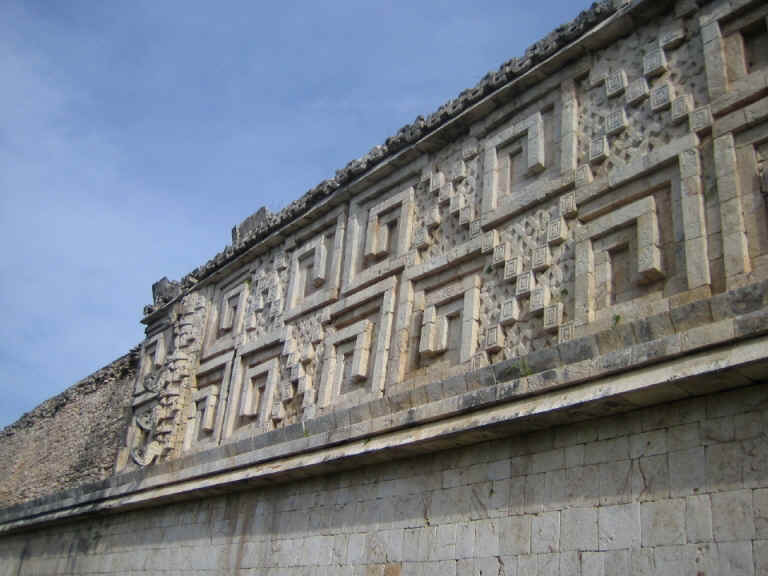 From Merida I took a one day tour to Uxmal ruin. Guide, little Mayan man was very good. Actually most of people who live here in countryside are Mayan. It is difficult to imagine that ancestors of these small and shy people selling souvenirs on sidewalks, created the great Mayan civilization. I also visited Cozumel. The world crisis is definitely felt here. I have never seen such a long line of empty taxi waiting for customers. Rows of jeweler stores, (tens of them) along the embankment all were empty, with not a single customer inside. Cozumel is considered to be an expensive place. But I found it is not. I stayed in Pepita hotel with AC, TV, hot shower for $25. At North of Cozumel, near Punta Norte I saw something unusual. A boat full of tanks and scuba equipment with three man armed with very serious spear guns were ready to go for fishing. Spearfishing with scuba equipment is prohibited everywhere I think. 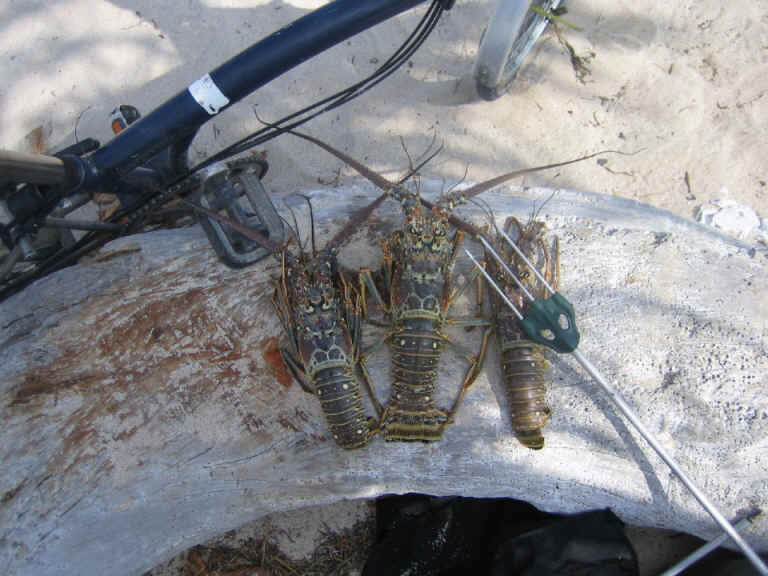 But here, on Cozumel, which is famous for scuba and snorkeling, these guys were going to spearfish with scuba, and they even did not hide it at all!